OK kids, you are about to get a front row seat so you can see 2 company owners having a friendly rules debate. Happens all the time, but I'll put it out here because we could also use some valuable input from you, our loyal servants viewers. 1 - Javelin attacks occur during combat but before engaged attacks. All of the skirmisher route activity (including free attacks) occurs in the pre combat courage phase. 2 - The backup rule does not indicate what phase the backup occurs, so I assume that it occurs immediately in the current phase. In this case we're still in the pre-combat courage check phase. 3 - Let's not forget the Atlatlmen behind the Javelineers! My thought is that they would fire on the backup units. For the record, I ruled that the javelin throws would occur after the skirmishers ran off and the target would be the nearest unit to the Javelineers after the backup activity. Otherwise, the Javelineers would have made their final rush without ever getting an opportunity to make their javelin attack. Both players agreed to this. However, I think we need to nail this one down and clarify it because it is a truly strange occurrence. Also for the record, Corey and I already had an initial conversation about this but I don't think I sent him the picture above so I don't know if he fully comprehended the situation. This goes down as the strangest Battleground ruling I've had to make so far. I may have brain-farted at that time, but here aremy current thoughts. 1) The Persian line units do not get to step forward when the shirmiehers auto rout. This was established in a ruling very shortly after I did this shortly after skirmishers came out, and it was pointed out that the back-up rule talks about having the option to back up a unit when it "fails a rout check." When a skirmisher auto-routs, it does not fail a rout check. And if the Skirmisher takes damage and dies, at that moment it was facing away from the enemy (and toward the lPersian line unit so the Persian line unit is not touching the rear of the Skirmisher and therefore not backing it up the moment it pops. 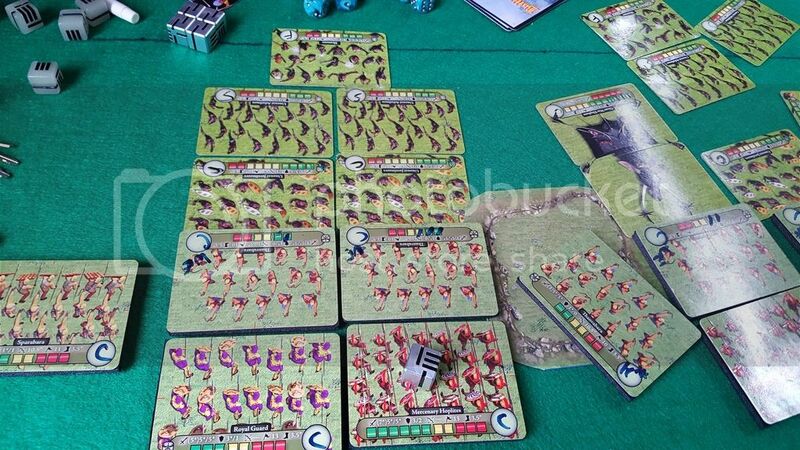 2) Javelins throw during the combat phase. So it seems that, after knocking the Skirmishers out of the way during the M&C phase, the javelins would throw at the Persian line units, who are in range and they now have line-of-sight. Similarly, the Atlatlmen would throw at the Persian line units. The question is - do the Javelineers get their Javelin attack and if so, who are they throwing at? The short answer is that the Javelineers would throw their javelins at the the routing skirmishers and the other Persia units would not be able to use the Back Up rule to move into combat. 4) Skirmishers bounce through the Persia line; Perisa unit do NOT step forward via Back Up. 5) Javelineers throw javelins at the Merc Hoplites/Royal Guard that are in range. The rules seem to support that sequence of events, and although it seems weird that the Javelineers would hold their fire in the heat of battle, it would have the effect of not letting skirmishers eat that javelin/pila throw. That seems wrong to me, as the whole point of skirmishers was to do that, but that seems to be what the rule says. Edit my Edit: Eric found out why this doesn't happen. Good eye, sir! 1 - Javelin attacks occur during combat but before engaged attacks. Technically no, but most people play it that way. The javelin attack "is treated like a normal ranged attack" so it can go in any order. All of the skirmisher route activity (including free attacks) occurs in the pre combat courage phase. Correct. And the javelineers would throw their javelins, because they met the criteria of Final Rushing that turn. This is admittedly not clear, but that was the intent. Edit: see above. The back up rule happens in whatever phase it is triggered. If the unit routs, and you choose to destroy the unit & step forward it happens in the courage phase. If the unit is destroyed in the Combat Phase, requiring you to step forward, then it happens in the Combat Phase. "If a backed-up unit fails a rout check (2.1) you may choose to destroy it instead of having it rout. If the friendly unit is destroyed (via the above) you just move one of its back-up units into its place." "If an unengaged skirmisher is final rushed by a non-skirmisher it automatically routs during the next Courage phase. (No check is taken)." Emphasis is mine. The skirmishers never failed a check so the Backup rule cannot be invoked. 1) The Persian line units do not get to step forward when the shirmiehers auto rout. This wasn't the issue. His line units behind the skirmishers where within 3.5" of my line. This means that when they charged the next turn my javs would not get to a chance to throw. Your units only perform ranged attacks if it is your turn and your unit was not engaged at any point of that turn. 8) Javelineers do not get to make a jav throw because the enemy unit started the turn inside 3.5"
They were unengaged at the start of the turn and are engaged on their front by a unit that began the turn out of their range. Cards are definitely good to have, but I like punching my opponent in the face, too! Ah right, that's it. Thanks! At this point the Javelineers should make a javelin attack. It's not crystal clear and I'm not sure why. The original way you laid it out is ideal and the part I quoted is an additional "note". Nothing in the actual rules says this and that note should just be stricken from the rules in my opinion. It's worth noting that the rules do state that the javelins would get to attack, because they met the criteria of final rushing. They're just not totally clear. We'll add this to the list of things to fix. Yes, certainly something to add to the list. Thanks for the discussion fellas, good work!